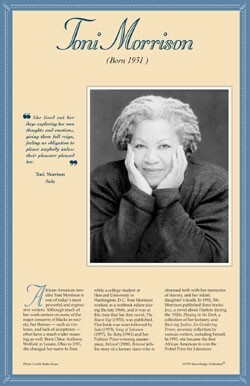 This educational poster of renowned American author Toni Morrison features a photo, a quote from her novel "Sula", and concise text about her life and career. Toni Morrison is an award-winning novelist who won a Pulitzer Prize in 1988 for her novel "Beloved." In 1993, Ms. Morrison became the first African American woman to win the Nobel Prize for Literature. 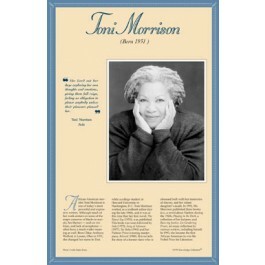 This poster is a great way to introduce students to this acclaimed and important modern writer.